Kay Davies is the Dr Lee’s Professor of Anatomy at the University of Oxford. Her undergraduate degree was in chemistry at Oxford and she moved into the biological sciences for her PhD studies. She went to France as a Royal Society Postdoctoral Fellow to learn protein biochemistry before returning to Bob Williamson’s laboratory in London to work on the development of prenatal diagnosis for the devastating muscle wasting disease, Duchenne muscular Dystrophy (DMD). There they developed the first DNA markers for the disease enabling prenatal diagnosis and carrier testing. 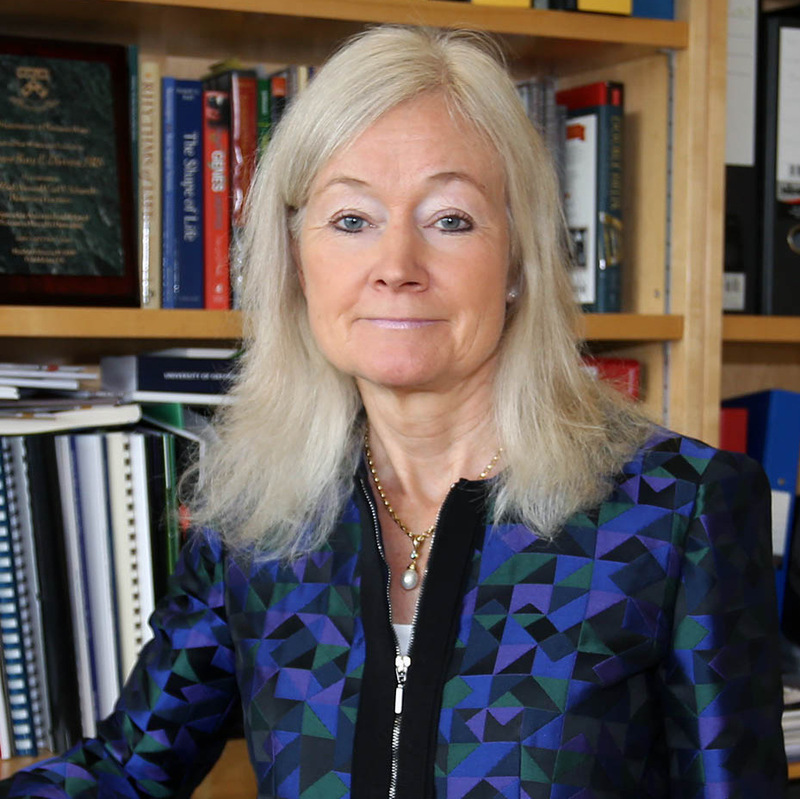 Professor Davies returned to Oxford as an MRC Senior Research Fellow to continue the work in DMD and her group has participated in several major discoveries in the field. Her work has progressed from the development of the first prenatal test for the disease to therapy. Specifically, she established one of the first maps of the DMD gene revealing that its high mutation rate was due to the very large size of the gene. Sixty-five per cent of patients have parts of the gene missing. With others, her group demonstrated that there are hot spots for deletion, allowing the development of rapid deletion tests for the disorder. She went on to show that a mild clinical presentation is compatible with large deletions of the central rod domain of the DMD protein, dystrophin. Despite some initial skepticism, it was later shown that these so called minigenes, modelled on these large deletions, function as a replacement for the missing gene. This dystrophin minigene has been distributed worldwide and is used as the basis for numerous gene therapy protocols. In 1989, the Davies group discovered a closely related gene with remarkable sequence similarity to dystrophin which they named utrophin. Kay Davies reasoned that utrophin if expressed in the same region of muscle as dystrophin, could compensate for the missing dystrophin in patients. Concomitant with this hypothesis, she later demonstrated that utrophin was able to prevent the pathology of the mdx mouse, the dystrophin deficient mouse model of DMD and went on to suggest that the up-regulation of the expression of the utrophin gene could have a clinical effect. Recently, collaborating with Summit Therapeutics, her group has discovered small molecules that can modulate utrophin levels. One of these molecules, ezutromid, is now in Phase 2 clinical trial. The Davies group is the leading group worldwide in utrophin modulation for the therapy of DMD. The impact of Professor Davies’ work has been acknowledged by numerous awards and honorary degrees. She is a founding member of the Academy of Medical Sciences and was elected a fellow of the Royal Society in 2008. She was made Dame Commander of the British Empire in 2008 for her services to science. Professor Davies has always been interested in the biotechnology sector and is co-founder of Summit Therapeutics and Oxstem. She is very committed to innovation and its role in health care of the future.